A few years ago, when my dad turned 60, my siblings and I decided to come up with a list of “60 Life Lessons” we had learned from him over the years. All of us, spouses included, wrote down 5-10 things that came to mind – some heartwarming, some funny, some just plain fact – and compiled it into a list that we printed out for him and read around a campfire. It was such a special way to celebrate his birthday, and such a great opportunity to reflect on all he had taught us. 1. That attitude is everything – you always try to look for the positives in a situation, and have helped us realize the impact we are able to have on our own reality. 2. How to be a good conversationalist – you go out of your way to make connections and always show genuine interest in other people, both those you have known and those you are meeting for the first time. 3. A strong worth ethic (for better or for worse.) That everything you want is yours to earn, not yours to be given. 4. That without your approval, a driver’s license is meaningless! 5. How to win respectfully and accept losing graciously. 7. Not to go along with something you don’t believe in just for the sake of “keeping the peace.” You stand behind your beliefs and opinions and aren’t afraid to rock the boat once in a while. 8. How to make frosting crackers, brown sugar sandwiches, and other delicious treats. 9. Not to put too much stock in any one day. New Year’s Eve is just another day. 10. What a true father looks like. Your sense of compassion, thoughtfulness, humor, and humility are a great example to all of us. One of the things that struck me in looking back at these was how many of the lessons were implicit – learned by example, rather than explicitly through words. For better or for worse, I think that’s really what parenting is: Teaching your kids through your actions and modeling the good qualities you want to see in them. So….as Father’s Day approaches this year, I got to thinking. My family’s gift to my dad on his 60th birthday would make a GREAT Father’s Day gift for any dad! And yes….you guessed it….the girls and I have been busy working on a “Life Lessons” gift for Jorden. Stay tuned to see how it turns out…! 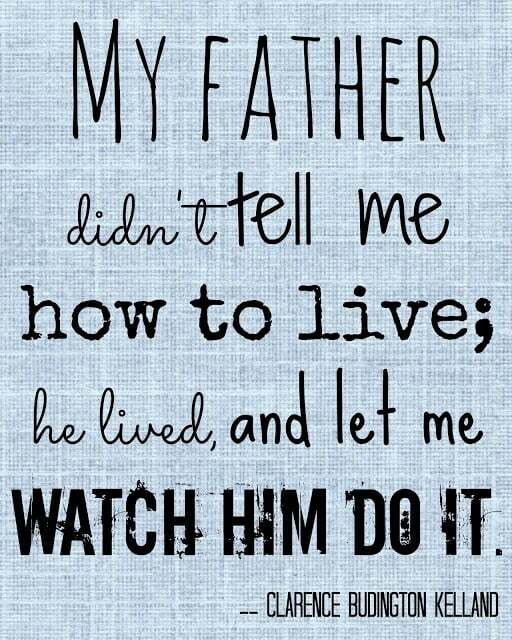 In the mean time, Happy Father’s Day to all the dads out there….first and foremost, my own! Thanks for living a life worthy of imitation. Love you, Dad! What a special story Cathy – thank you for sharing! Sounds like a wonderful 60th birthday gift and one he will cherish forever. I love the idea! I love your dad, Cathy. And reading some of these gave me goosebumps. He IS a really good conversationalist, and so unassuming about it. I never even thought about how good he is at it. LOVE the printable and the quote, Cath! I love this printable as well as the lessons learned. Thanks so much for sharing it at my Real Family Fun link party. I’m featuring this today on G+, fb, and twitter. Have a great week. Cathy, thank you for sharing this. I loved my dad so much, and lost him 10 years ago. This saying seemed quite true for me, so I saved it on Pinterest. Father’s Day is always bittersweet for me, but I love to remember him.